There are dozens and dozens of turtle species in North America. ETR currently has several species native to the U.S., including mud turtles, musk turtles, spotted turtles, sliders and cooters, and box turtles. 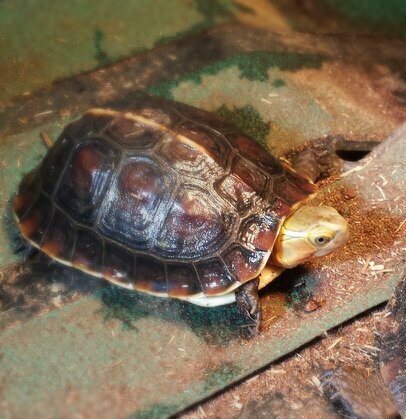 I’ve got a few pictures of my turtles. Australia and New Guinea are home to short-neck turtles and snakeneck turtles. These are different from turtles we see in the U.S., which have neck that go in-and-out in a straight line fashion. When short necks and snakenecks pull their necks in, they fold them to the side. Here are a few of our Australian species. These are adult Cuora mouhotii, which are Asian turtles also know as the Keeled Box Turtle. Spotted turtle eggs, part 3! As long as I’ve kept and bred turtles and tortoises, I’ll never get tired of seeing a girl lay eggs. Even more exciting is watching them hatch! Let’s all hope for babies in 2 months! The morning after the female laid her eggs and covered the nest, I retrieved her eggs to incubate in a Reptibator, which is an incubator for reptile eggs. She’s an experienced egg layer and does a great job hiding her nest. In the wild, nests are vulnerable to predators on the land. It’s instinct; however, I’ve noticed it does take some experience to master the art of hiding her nest. My younger, smaller female Spotted doesn’t do a very good job covering her nests, yet! After carefully scraping away dirt until the eggs appeared, I dug a little more to define the eggs. They’re mostly still buried, but you can see enough to count 3 white egg gems! These eggs seem larger than usual, although I haven’t had any Spotted Turtle eggs in a couple of years so maybe I don’t remember them clearly. I’ve also had many eggs from my musk turtles; those eggs are tiny, and maybe those are cluttering my mind. Anyway, once I had the eggs completely uncovered, they were ready for transfer to a plastic container with a layer of vermiculite. Vermiculite is a common incubation medium for reptile eggs because it holds moisture well. I wet the vermiculite, squeeze excess water from it, and spread it in the plastic container. I nestle each egg into the container and then the waiting begins. If fertile, they’ll hatch in about 60 days. As they incubate, I check the temperature and humidity regularly. I want the humidity to be close to 80%, which is hard to maintain. Therefore, I mist the eggs frequently. I also placed some plastic wrap over a portion of this container because the eggs were slightly dented. They’ve plumped up nicely since doing that. I want to follow-up on the nesting and egg laying last week. It takes her several hours to dig the nest, lay eggs, and cover up the nest. She has more stamina than me, so some of my work in documenting her activity took place over two days. Digging nests is hard work and she has to make sure she gets it just right. The nest is excavated with the back legs, not the front legs! I filmed her digging for a couple of minutes, then I left her alone for a while. When I came back to check her progress, she had already laid 2 eggs and I was just in time to see the 3rd egg drop. You can see in the video how she arranges the eggs in the nest with her back feet. She does everything by feel because she can’t see what’s happening behind her. I love her dedication to the task. Isn’t she marvelous? I don’t remember her previous eggs over the last several years being as large as these. If they’re fertile, they should hatch in about 60 days. The final part of my documentation took place the next morning. Learn about that in my next post.